We want to feed our dogs only the best, but are you sure you know how much to feed them and when? There are different ways to feed your dog, depending not only on their age, but also on their size. For instance, large breeds can be fed once a day while small breeds can be fed once in the morning and once in the evening. Dry food can be left out during the day for the dog to eat as it wants to. Choose a dog food that has been scientifically formulated like Spar pro-balance. The guidelines on the packs, make it easy to know how much to give your dog. The amount of food you need to feed your dog will depend its weight. Guidelines will indicate much food a dog should be given per 10 kg of body weight. Large and giant breeds, for instance, may need 1 cup of food for every 10 kg, while smaller breeds may require 1 – ½ cups per 10 kg (smaller breeds require 15-25% more calories per pound than large breeds). If you’re feeding your dog more than once a day, divide the required amount of food by the number of meals. Weigh your dog at the vet on an approved scale. The vet will also be able to tell you the number of calories that your breed needs per day. This is important when it comes to treats, as they should not make up more than 10% of the dog’s diet. These treats should also be healthy, like those in the SPAR pro-balance range. When you are introducing new food to your dog, do it slowly over the course of a week. Reduce the old food and give more of the new one every day until day 7 when you give them only the new brand. Love is a four letter word when it comes to our dogs! Formulated and recommended by specialist animal nutritionists, the SPAR pro-balance range is suitable for dogs of all ages, breeds and sizes. SPAR pro-balance for adult dogs contains 20% top quality protein and 8% fat. In addition there is extra Vitamin E plus antioxidants for immune support. The balanced nutrients also help your dog’s digestion. The adult food range is available in three flavours – Grilled Chicken, Roast Lamb and Prime Rib – and packaged in easy-to-carry bags of 1,75kg and 8kg. It comes in a range of shapes and colours to add variety to your dog’s diet and the specially coated kibble enhances palatability. 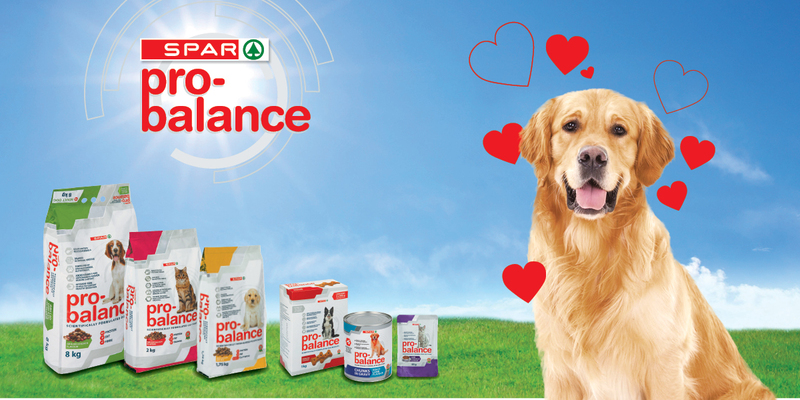 SPAR’s pro-balance range, includes a delicious chicken and rice variety especially devised for puppies. It is vital that you introduce your pet to quality food and adequate nutrition from a young age to ensure healthy development and SPAR pro-balance helps you do this. The puppy variant is specially formulated to support the growth of strong, healthy bones and teeth thanks to its calcium to phosphorus ratio, while the good quality animal protein supports the development of healthy muscles. Next Article5 exquisite gardens you have to visit!